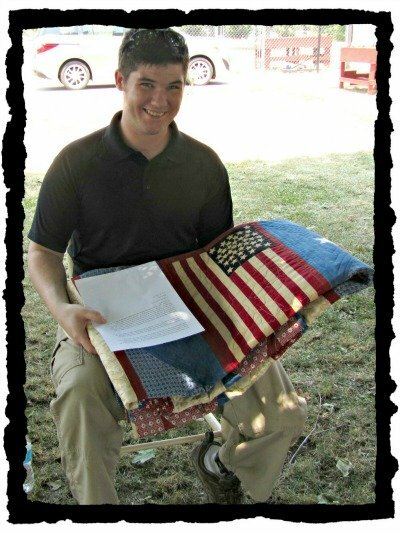 So, you want to learn how to machine quilt! Are you a hand quilter, an occasional quilter or a long-arm quilter? Have you tried your hand at learning how to machine quilt? 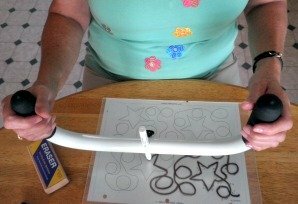 The "Quik Trainer" is a tool designed by La Li La designs to help those of us who are either learning or would like to learn the art of quilting with a machine. The tool is designed to develop your dominant and nondominant hands and forearms at the same time. It will show you how to master the art of quilting using a domestic sewing machine or a longarm quilting frame. 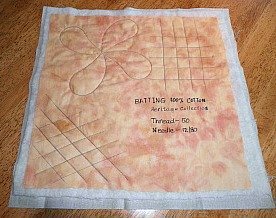 Those of us who are hand quilters know that it takes a bit of know-how to make your quilting stitches hold up under lots of wear and tear. Hand quilters will never be replaced. They just become specialized! Hand quilting is a rather fragile but beautiful way to quilt. With the introduction of the "Quik Trainer" tough jobs are left for the machines and the delicate jobs are for wall hangings and table toppers. For the price of one quilting class you can purchase the "Quik Trainer" and enjoy the unlimited training sessions in which to practice. It takes a few weeks to learn how to machine quilt, that is, if you are diligent about a schedule. The "Quik Trainer" can be purchased for just under $40 at your local quilting shop. I can't say it loud enough...this one is a winner and will teach you how to quilt using your domestic sewing machine. As you improve and your muscles develop you can increase the practice time. The training exercises are for skill building and muscle development. It is important to develop your dominant and nondominant hands and forearms at the same time in order to feel comfortable with following a pattern or drawing a pattern from memory. Using a "Quik Trainer" tool, your shoulder and neck muscles may become sore. But no worst then using a longarm machine or sitting at your sewing machine doing free-motion quilting. That's why it is recommended that you limit the training sessions to 15 minutes a day in the beginning. 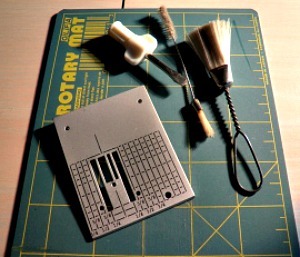 The "Quik Trainer” tool comes with everything you need for mastering how to machine quilt! It comes with a, drawing board and dry eraser, a drawing pen and a drawing tool that either acts like your fabric or your long-arm machine. The reason for this is in longarm quilting you push the machine and in domestic machine quilting you push the fabric. The difference between the domestic sewing machine and the long-arm machine when used for learning how to quilt is minimal. 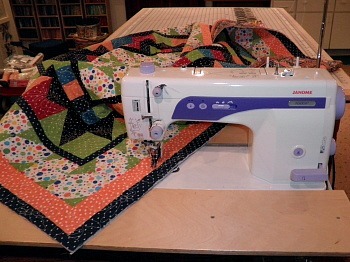 Both machines can be used for free-motion quilting. The "Quik Trainer" tool kits are the same except for a plastic envelope, otherwise named fabric, or the hard plastic drawing board, otherwise named frame. Whether the drawing handles point up or down; and whether the gloves are on or off the methods are similar. The reason for the slight differences in the tool kits is easy to understand. With long-arm quilting you push the machine and with a domestic sewing machine you push the fabric. Remember 15 minutes each day is the limit until your arms gain muscle; erase your drawings and draw again and again until you grasp the rhythm and memorize the design in your sub conscientious memory. Open the bobbin case to remove a buildup of lint and threads. 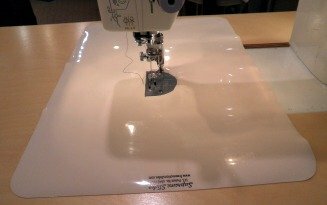 As with every new quilting job it is well to spend a few minutes preparing your sewing machine for a new venture - in this case using free motion quilting when learning how to machine quilt. Follow the directions in the owner's manual and remove the lint and threads from the bobbin area by brushing out the debris that may have accumulated with regular sewing. It is best to use a soft brush, much like the one that came with your machine. As you can see mine are very well worn. Take apart the bobbin case and brush out the lint and threads. Then oil your machine. Using liquid air is not recommended for blowing out the bobbin area as you could easily embed the debris further into the moving parts of the bobbin area. If this happens you may have to make a trip to the repair shop. Change out your wide-hole throat plate for the single-hole throat plate and insert it into the machine. This single action will improve your stitch quality when learning how to machine quilt because the fabric cannot be pulled under when quilting. ...with the Teflon Slider when you are finished quilting the clean up is quick and easy. All you need do is roll up the Teflon sheet and put it back in the tube. Plus, there is no build up of residue spray on the surrounding area of your work space which may have to be cleaned up. You will need a mascot called Slider...in our area, Slider is a well known entertainer for the small children at any Cleveland Indians baseball games. Here it is a Teflon sheet that when placed under the throat plate area (pink side down) it will allow the fabric to slide while you are stitching. The recommended queen size slider measures 11 1/2-inches x 17 inches and is designed by Award-Winning Quilter, Pat LaPierre. The queen size slider is available at Amazon by clicking here and is a must for free-motion quilting. Somehow when the fabric "glides” all that is left to do is engage your mind to recall the design. Attach the free-motion or darning foot that is appropriate for your machine. Adjust the top tension - generally you will need to lower the tension. The tension is affected by thread, fabric, needle, humidity and batting. Position the Supreme Slider on the machine bed with the needle centered in the punched hole...Note it is fine to enlarge the punched hole itself to expose the small hole throat plate in its entirety. Place plate on top of the slider (pink side is the underneath side) match up the small hole in the plate with the small hole in the Supreme Slider ; draw around the plate and use a small pointed pair of scissors to enlarge the opening to fit the plate. Lower the feed dogs and set needle in the down position with the needle in the fabric. This allows the quilt to be repositioned when quilting resumes and the quilt line remains fluid. For free-motion quilting, the feed dogs are lowered or disengaged and the quilter controls the movement of the fabric. Use baby wipes to clean the lint off the Supreme Slider back (pink side) or use warm water and a cloth until clean. Wipe the excess water off or air dry before putting it back on your machine. Use a large table or set-in cabinet to support your quilt when learning how to quilt. Be sure your chair is high enough so your elbows bend at a 90 degree angle when sewing. When learning how to machine quilt you will find that there is a lot of drag on the quilt. To eliminate drag, position the Supreme Slider on the machine bed. Place your quilt under the needle. Turn the hand wheel to pull the bobbin thread up through the quilt sandwich. Lower the presser foot and sew! To make a more consistent stitch, set your machine at 1/2 speed and keep the pedal down. Remember to bury the "start" and "finish" thread tails between the batting and the backing. The speed and technical advantages of quilting makes it possible to finish a whole quilt once you have a bit of training under your belt. No matter what quilting method you choose when learning how to quilt it is absolutely necessary to baste the three layers together either by tacking all three layers, pinning all three layers, or using long basting stitches. The three layers, called a sandwich, should be securely held together without any lumping or movement of the batting. Allowing the batting to “wad up” will cause unevenness and appear to have a wavy effect. For machine quilting , free motion quilting, or longarm quilting it is best to work with a batting that is thin and will lay flat. It is important to give serious thought to the type of quilting designs you use. Machine quilting will not look like hand quilting. The stitching lends itself to a smooth orderly symmetrical design. Use long straight or slightly curved lines with the presser foot engaged when learning how to machine quilt. Work with the machine tension until you get the best stitch length for the material and batting being used. Earlier on our Quilt Batting page we outlined how to make 14-inch sandwich blocks to assist in learning the difference between the various quilting supplies on the market today. Each sandwich block was stitched out in an identical format using different combinations of stitches, needles, thread and equipment. The object was to show what effect the batting has on the quilting stitches using various equipment and thread for your particular sewing machine. I recommend you make a few of these sandwich blocks if you have not already done so. This will give you a nice reference tool on which to base your decision of what batting is best for your particular quilt top. These squares become a permanent part of your reference tools. The thread dictates the needle size when quilting. It’s important to get the right mix between the two. A cotton machine embroidery thread works well when machine quilting. Next, choose a matching thread or a good contrasting color when stitching. Using an invisible nylon thread on the top and size 30 cotton machine embroidery thread in the bobbin will help solve the thread color choices. The disadvantage is it has a glow and makes your stitches noticeable plus it is difficult to knot. Also, nylon thread may not outlast the life of your master piece and therefore should be used with some trepidation. If you can’t match the thread to the multicolor of the fabric, then an alternative would be to choose a gray color. Gray will take on the colors in the fabric and will blend well. Threads that blend hide many stitching errors. It is a good idea to use a slightly larger needle than normal so the thread penetrates the fabric without puckering. The needle hole must allow the thread to go through the eye of the needle without binding. However, the needle cannot be so large that it leaves a conspicuous hole. If the needle is too small the thread will fray or cause the machine to skip stitches. When you're first learning how to machine quilt it will seem overwhelming so I advise you to take breaks often. 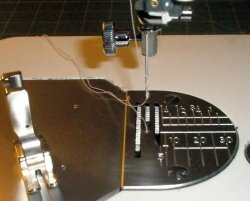 Use the “needle down” function on your machine in order to maintain straight quilting lines. Set your quilting stitches to be about 12-stitches per inch. 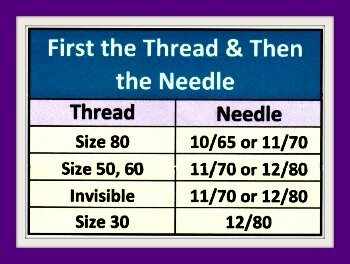 Select the right thread and needle for your fabric/batting combination. Always start with a new needle and change about every 6 hours of quilting. To knot all beginning and ending stitches gently apply pressure by placing your hands in front of the presser foot and take a few stitches without advancing the fabric. This will not hurt your machine or disengage the feed dogs or walking foot. When you learn to quilt sew the longest unbroken lines in or around the center of the quilt. Work from the center of the quilt to the outside edges when learning how to quilt. Study the design and try to break the quilt into quarters from the center out. These lines will be the first quilting you do. Then break each quarter into quarters again making the quilting area as small as possible. Always work from the center out when learning how to machine quilt using a domestic sewing machine. If there are no strong horizontal or vertical lines, go ahead and begin stitching in the center and work in a circular motion to the outer edges. Let's Talk About Quilts. Join us on Facebook. "No Hassle" Money Back Guarantee. 48-Hr turn around for Q-T related questions. Beginners Love Us, so do the Experienced. 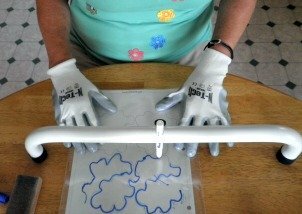 Free sharing of quilting techniques & ideas. Utmost accuracy when creating quilt patterns. Find fun digitized motifs in our great selection of many machine quilting patterns. I promise to use it only to send you Quilting-Tidbits. How do I bind a quilt? How do I get your FREE patterns? Will you digitize a pattern for me? Have your patterns been tested for accuracy? How do I know what kind of batting to use? You can get it here! We work hard to bring you "free stuff"...If you feel our site is worth a cup of coffee, please consider helping us help YOU. Click to Buy Us a Cup of Coffee! Feeling Wonky Today..try this one!